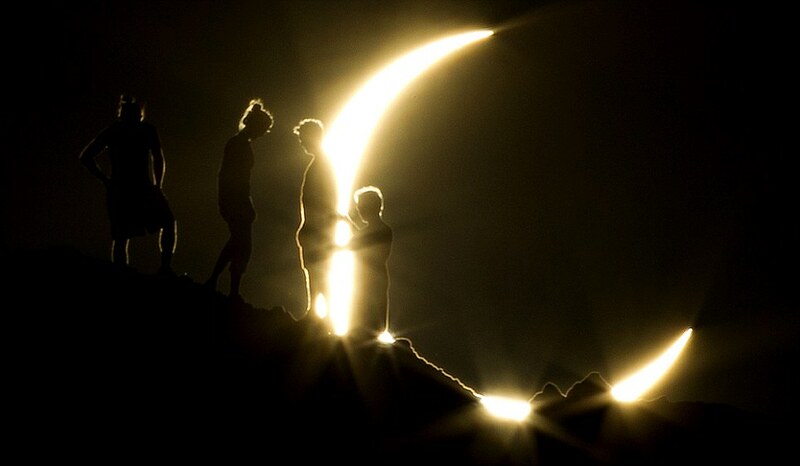 Skygazers around the world excitedly gathered outside to watch the rare annular eclipse, which produces a ‘ring of fire’ around the sun, when it swept across Asia and the western United States on Sunday evening. But these incredible pictures show that all those Earth-bound astronomy fans had it wrong, and that the best vantage point from which to examine the unusual phenomenon was in fact space, where the view could not be impeded by pesky obstructions such as clouds. The photographs were taken by the Japanese-owned Hinode telescope satellite, which orbits the Earth but is constantly pointed at the Sun, allowing for permanent observation of the body at the centre of our solar system. Along with the stunning images, a video has emerged which shows the progress of the moon across the face of the sun, captured by photographer Cory Poole who edited together 700 separate photographs taken with his telescope. But the view wasn’t too bad from Earth, as the moon slowly ‘bit into’ the sun, creating incredible visual effects such as a golden heart gleaming through branches in Los Angeles. The annular eclipse, in which the moon passes in front of the sun leaving only a golden ring around its edges, created incredible visual effects around the world – and photographers let their technical imaginations run wild with ‘trick’ shots such as this heart-shaped sun. In Japan, ‘eclipse tours’ were arranged at schools and parks, on pleasure boats and even private airplanes. Similar events were held in China and Taiwan as well, with skywatchers warned to protect their eyes. ‘That’s got to be the prettiest thing I’ve ever seen,’ said Brent Veltri of Salida, Colorado. At the Taipei Astronomical Museum in Taiwan, the spectacle emerged from dark clouds for only about 30 seconds. But the view was nearly perfect against Manila’s orange skies. ‘It’s amazing. We do this for the awe [and] it has not disappointed. I am awed, literally floored,’ said astronomical hobbyist Garry Andreassen, whose long camera lenses were lined up with those of about 10 other gazers in a downtown Manila park. Hong Kong skywatchers weren’t so lucky. 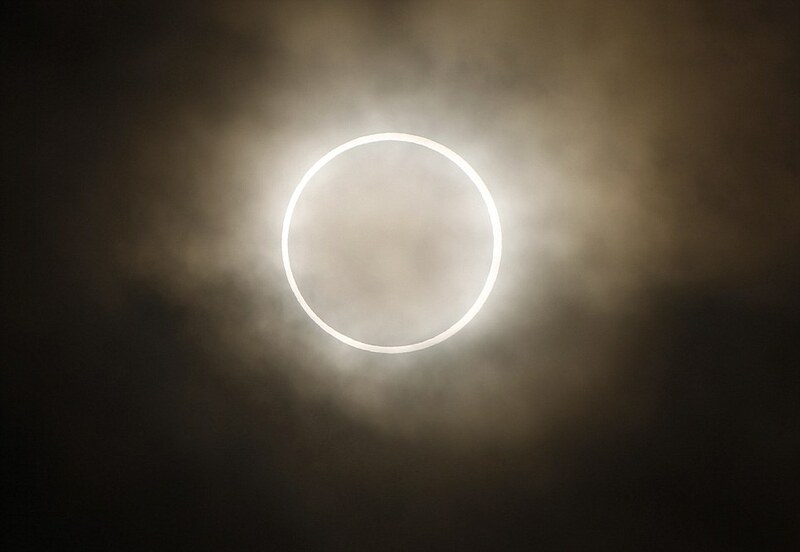 The ‘classic’ view of an annular eclipse is as a burning ring. In the U.S., viewing parties were held at observatories in Reno, Nevada, and Oakland, California, and elsewhere. In some areas, special camera filters for taking photographs have been sold out for weeks in anticipation of the big event. Not every eclipse of the Sun is a total eclipse. On occasion the Moon is too small to cover the whole of the Sun. This is because of the Moon’s orbit around Earth which is oval or elliptical in shape. As the Moon orbits Earth its distance varies from about 221,000 to 252,000 miles. This 13 per cent variant makes its apparent size, from our perspective, vary by the same amount. If an eclipse occurs while the Moon is on the far side of its elliptical orbit, it appears smaller than the Sun and can’t completely cover it – creating the ‘ring of fire’ effect due this weekend. The eclipse was broadcast live on TV in Tokyo, where such an eclipse hasn’t been visible since 1839. Japanese TV crews watched from the top of Mount Fuji and even staked out a zoo south of Tokyo to capture the reaction of the chimpanzees – who didn’t seem to notice. Several hundred people gathered along the Kowloon waterfront on Hong Kong’s famed Victoria Harbor, most of them students or commuters on their way to work. 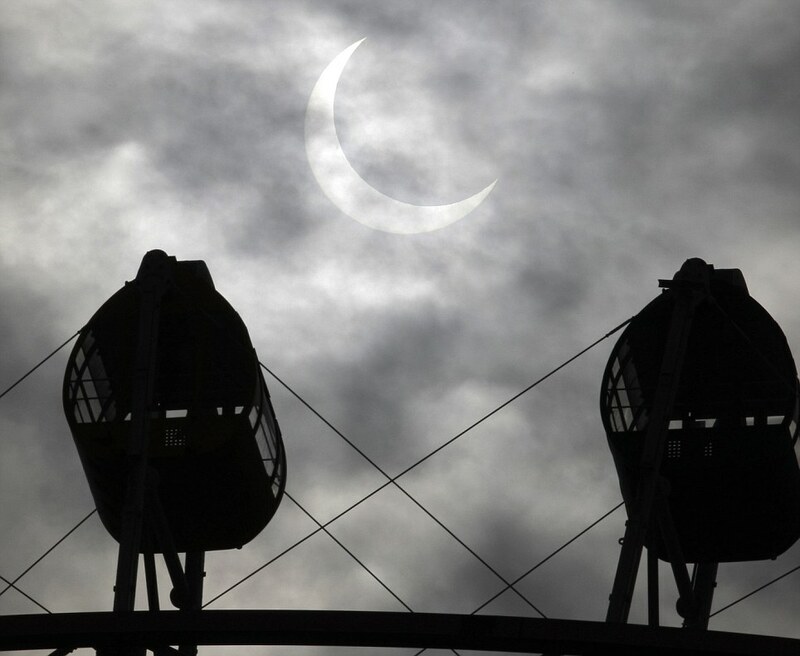 The eclipse was already underway as the sun began to rise, but heavy clouds obstructed the view. The eclipse followed a narrow 8,500-mile path for 3 1/2 hours. The ring phenomenon lasted about five minutes, depending on location. People outside the narrow band for prime viewing saw a partial eclipse. ‘Ring of Fire’ eclipses are not as dramatic as a total eclipse, when the disc of the sun is entirely blocked by the moon. The moon is too far from Earth and appears too small in the sky to blot out the sun completely. Doctors and education officials have warned of eye injuries from improper viewing. Before the event started, Japan’s Education Minister Hirofumi Hirano demonstrated how to use eclipse glasses in a televised news conference. Police also cautioned against traffic accidents – warning drivers to keep their eyes on the road.